Railpictures.ca - Richard J Hart Photo: “Directional running” in this area means that CN and CP trains are often seen together. CP 9776 is about to head east out of North Bend in charge of a coal train, while CN 2601 takes on a fresh crew. | Railpictures.ca – Canadian Railway Photography – photographie ferroviaire Canadienne. Copyright Notice: This image ©Richard J Hart all rights reserved. 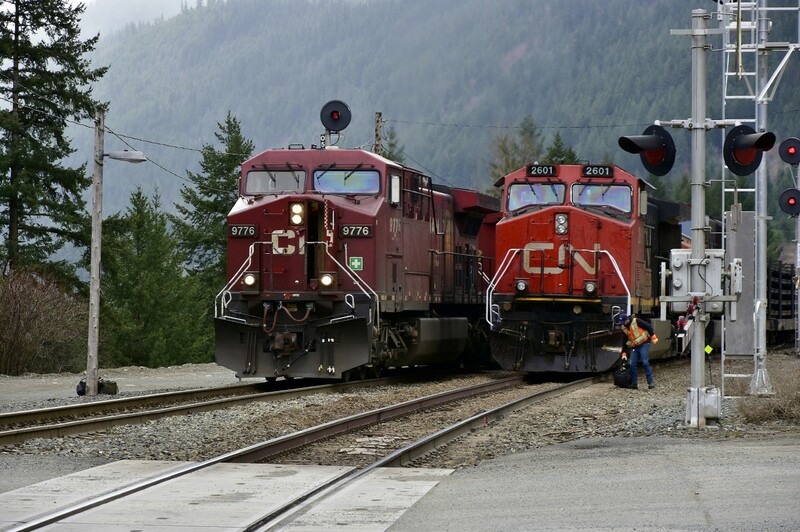 Caption: "Directional running" in this area means that CN and CP trains are often seen together. CP 9776 is about to head east out of North Bend in charge of a coal train, while CN 2601 takes on a fresh crew. Great Shot Richard! Very rare to see Canada’s 2 biggest railroads (CN and CP) side by side in a lashup, let alone get a side by side shot of them! !